Click on an item photo to view our D.R. Dimes Catalog Pages. Douglas R. Dimes has been commissioned by museums such as Independence Hall, Old Sturbridge Village, The Smithsonian and Colonial Williamsburg®, recreating their best examples of Early American design. Many of these chairs and pieces are offered in his "Branded Reproduction" and "Benchmark" catalogs. For thirty plus years, D.R. Dimes has put authentic design and excellence of craftsmanship ahead of sales, profit and growth. He still makes all of his furniture in the old manner, for instance, steam bending chair bows and fans and hand carving ears and knuckles. Seats are carved from Eastern white pine, the bendings are oak and the leg turnings are maple. The Dimes Windsors are amazingly comfortable and functional. 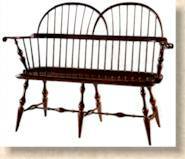 The first American Windsors date between 1730-1740 in Philadelphia, the distinctive style of the Colonial craftsmen resulting in a lighter weight, more flexible chair. In the early 1980s, customers requests for tables and cabinets equal to his signature chairs led Dimes to further study and mastery in multiple forms of furniture production, demanding enlargement of his shop as well. His philosophy of continuous improvement has resulted in the availability of a large selection of useful, truly beautiful, historically accurate reproduction furniture. The Benchmark Collection by D.R. 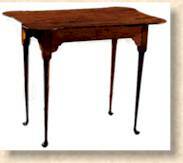 Dimes is a line of Country Chippendale and Queen Anne furniture that is true to it's heritage. Each piece is hand crafted in the shop of Douglas R. Dimes who has been making period reproductions for almost thirty years. No detail of construction is left out, from joinery techniques to the hand carved shells to the hand rubbed finish. The dovetail joints in cases and drawers, the hand planed pine backboards and the hand shaping of cabriole legs are all details that require tremendous time, effort and skill but are essential when your goal is to make the finest reproduction furniture available. Only the highest quality lumber goes into our furniture. Beautifully figured tiger maple and richly colored native cherry are brought in from sawmills all over the northeast. We admit that all this labor adds to the cost of our furniture but we feel strongly that it adds much more to it's value. A piece from D.R.Dimes Benchmark Collection is an investment that will last more than a lifetime.